Yes, I reminded him *again* about how we know nothing about the soil back there. For all we know the previous gardener sprayed Round Up and who knows what. So what did he do? He went and bought garden soil. The only kind he knows, which is Miracle Gro, in the non organic version. He must have talked to someone who knows something about soil, because he also got chicken poop. And does it look like enough for the huge area we are growing in? Of course not. OMG. Indian dude flexing his macho gardening muscle. I don't mind that he wants to do the gardening. I just don't like the way he does it! 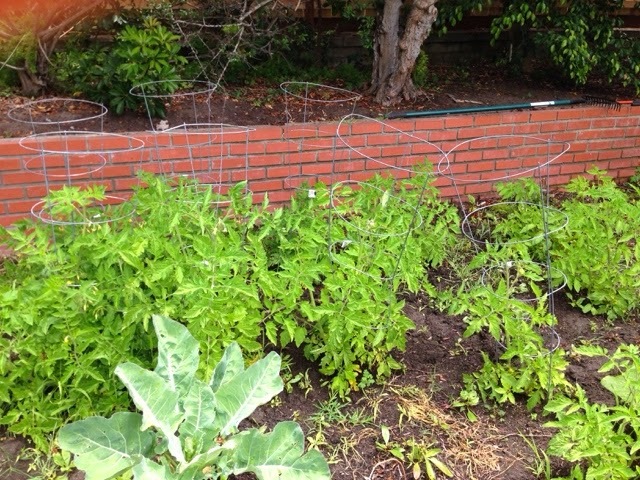 And here is how the garden looks today. 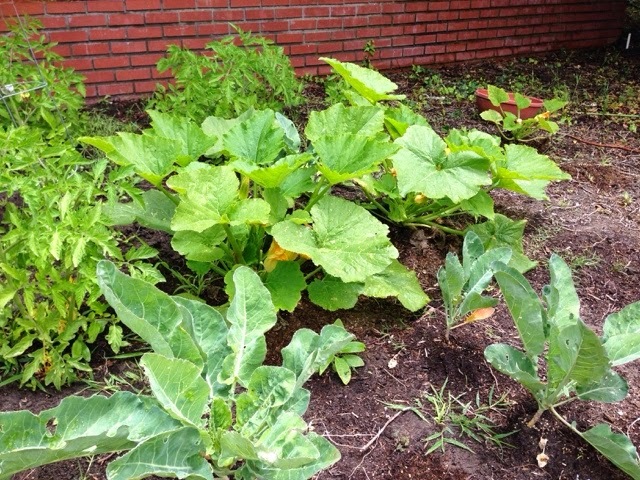 These are zucchini squash plants. We have harvested 3 large zuchini. 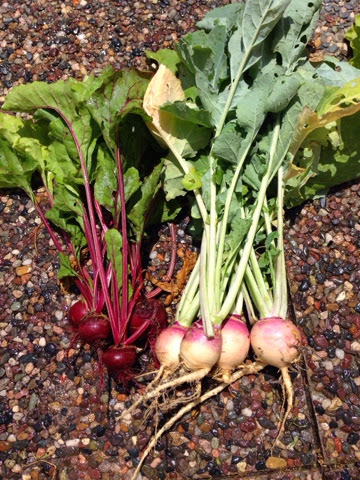 Beets and rutabagas pulled out today! I'm back from blog death! Well, technically my blog didn't die, but it was dead here for six months of not posting. My last post was in July 2013, right after our trip to Barcelona, where I announced we were getting ready to move to San Diego in August. Well, what a big change it has been for the whole family. Leaving all of our friends and family behind- all of the friends my kids have grown up with and homeschooled with, my daughter's gymnastics team mates, my close mama friends, and some of the neighbors we had become good friends with over the years. Here my husband and I are at mid life, thousands of miles away, trying to form a new circle of friends that took us years to create. It's really hard, really really it is. Our kids will be fine, they will make friends quickly. In fact, they already have, but for us big people, it's going to take more time. In San Diego there is traffic and large crowds of people every where we go. It makes Orlando seem like a rural farming town. Even grocery shopping can be a rediculous time zapper. But yes, it's beautiful here. You cannot beat the near perfect moderate temperatures and sunshine pretty much year round. Having access to lots of really fresh, organic food from mostly California farms. And being able to see the beach, the desert and the mountains all in one day. Its' really fantastic. You might be wondering what we have been eating all this time, since this is a food blog not a travel blog. If I have to summarize it, I would say we eat a lot of food from Trader Joe's. It's the best health food store here, hands down. I can get in and out in under 45 minutes because the store is small and well stocked. I can fill my cart to the top including the child seat for $150-160 and it lasts the whole week. No need to go out for lunch or dinner. I might have to buy fruit from Von's because their fruit is priced better, but that's my only other stop for groceries during the week. While not everything sold at TJ's is perfectly Organic and Vegan (or even Gluten Free), their prepared foods section is so crazy convenient. I mean who doesn't love their Japanese Style Fried Rice with edamame and carrots? Their Spinach and Kale pies? And what about their Stuffed Tofu Turkey? Not having to think too much about what to cook and relaxing the "food rules" some days has helped to make life here a little less stressful for us all in the the past 5 months. Below is a recent photo of most of the food from a shopping trip. Missing in the photo are some sprouted wheat bagels, sourdough bread, a few packages of berries, a bottle of California wine called "Cocobon", sparkling water, hummus dip, frozen and fresh berries, bananas, and pomegranite "sherbert". We are not sure how much of a garden we will be able to build since we have a rental, but I assure you, we will have a garden!! We have space in the back yard, but we cannot build anything permanent. So I'm looking into an idea I have about creating some planters out of something I will reveal in a future blog post. Reviewing the book "Feed Zone Portables", a brilliant recipe book of portable packets of yumminess for athletes. Writing a product review for Viva Labs Coconut Oil. And that about wraps things up! Thanks for reading this far down :-) I'm going to Home Depot tomorrow to get all the things I need too make awesome soil for the planters, so stayed tuned on FaceBook or subscribe to my feed!